Muhammad Yousuf, a non-Pashtun, German-educated technocrat who had been minister of mines and industries became prime minister in 1963. The new government both represented and sought change. Within two months, ordered an investigation into the abysmal conditions of Afghan prisons, and reached an agreement reestablishing diplomatic and trade relations with Pakistan. The single greatest achievement of the 1963-73 decade was the promulgation of the 1964 constitution. A mere two weeks after Daoud's resignation, the king appointed a commission to draft a new constitution. In the spring of 1964, he ordered the convening of a loya jirgah--a country-wide gathering that included members of the National Assembly, the Senate, the Supreme Court, and the constitutional commission. One hundred and seventy-six members were elected by the provinces and thirty-four members were appointed directly by the king. Although the assemblage of 452 persons (including six women) that met in September 1964 was composed primarily of officials who could be expected to support the royal line, the loya jirgah also included members elected from around the entire nation. On September 20, the document was signed by the 452 members and ten days later, the kings signature transformed it into the new constitution. The constitution--and the deliberations that produced it--demonstrated several noteworthy changes in political thinking. It barred the royal family, other than the king, from participating in politics and government--a provision that was perceived as keeping Daoud out of politics. Individual rights were strongly championed by provincial delegates over tribal ones. Conservative religious members were persuaded to accept provisions they once considered intolerably secular. Although a lengthy debate ensued over whether the word Afghan should be used to denote all citizens of Afghanistan (many people regarded it as a reference only to Pashtuns), the loya jirgah agreed that this term should apply to all citizens. The constitution identified Islam as "the sacred religion of Afghanistan," but it was still necessary to persuade many conservative members that their religion had been enshrined in the constitution. Although Article 64 decreed that no law could be enacted that was "repugnant to the basic principles" of Islam, Article 69 defined laws as a resolution passed by the houses of parliament and signed by the king, with sharia to be used when no such law existed. The constitution's provisions for an independent judiciary gave rise to heated debate among religious leaders, many of whom supported the existing legal system based on religion. Although religious judges were incorporated into the new judicial system, the supremacy of secular law was established. The new constitution provided for a constitutional monarchy, with a bicameral legislature, but predominant power remained in the hands of the king. Most observers described the 1965 elections as remarkably fair. The 216-member Wolesi Jirgah, or the lower house of parliament, included representation not only by antiroyalists but also by the left and right of the political spectrum. Included were supporters of the king, Pashtun nationalists, entrepreneurs and industrialists, political liberals, a small group of leftists, and conservative Muslim leaders still opposed to secularization. The king nominated a new prime minister, Mohammad Hashim Maiwandwal, who quickly established friendly relations with the students, while making it clear that he was in charge and there were limits to student political activity. On January 1, 1965, the People's Democratic Party of Afghanistan (PDPA) was founded. The PDPA, a communist party in fact if not in name, was established for the primary purpose of gaining parliamentary seats. The PDPA was comprised of a small group of men, followers of Nur Mohammad Taraki and Babrak Karmal, both avowed Marxist-Leninists with a pro-Moscow orientation. The fact that four PDPA members won parliamentary seats suggests that government efforts to prevent the success of its leftist opponents by intervening in the balloting were halfhearted. Taraki, one of the four PDPA members elected to parliament in 1965, started the first major leftist newspaper, Khalq (Masses), which lasted little more than a month before being silenced by a government ban. The Afghan political system remained suspended between democracy and monarchy, although it was, in reality, much closer to the latter. Political parties continued to be prohibited because the king refused to sign legislation allowing them. Democracy nevertheless maintained a toehold in the lower house of parliament where free criticism of government policies and personnel was aired. In 1967, only a year and a half after its founding, the PDPA had split into several factions. The two most important of these were the Khalq (Masses) faction headed by Taraki and the Parcham (Banner) faction headed by Karmal. Although the split was couched in ideological terms, it was largely due to personality differences between Taraki and Karmal and to their respective preferences in organizing tactics. Taraki favored a Leninist-type party based on the working class, while Karmal wanted a broad democratic front. Supporters of Khalq were primarily Pashtuns from rural Afghanistan, while Parchamis tended to be from urban areas, to come from a better socio-economic background than Khalqis. Unlike the Khalqis, Parchamis included many non-Pashtuns who spoke Dari (Persian) in their ranks. The monarchy did not treat both factions equally. Karmal's Parcham faction was allowed to publish its own newspaper, Parcham, for more than a year (from March 1968 to July 1969) while the Khalq faction had its paper banned. As a result, Khalq accused Parcham of having connections with the king and bitterly denounced its rival as the "Royal Communist Party." The 1969 parliamentary elections, when voter turnout was not much greater than in 1965 produced a legislative assembly essentially consistent with the real population and distribution of power in the hinterland, in that conservative landowners and businessmen predominated and many more non-Pashtuns were elected than in the previous legislature. Most of the urban liberals and all of the female delegates lost their seats. Few leftists remained in the new parliament, although Karmal and Hafizullah Amin had been elected from districts in and near Kabul. Former prime minister Maiwandwal, a democratic socialist, lost his seat when the government selectively influenced the elections. Between 1969 and 1973, instability ruled Afghan politics. The parliament was lethargic and deadlocked. Public dissatisfaction over the unstable government prompted growing political polarization as both the left and the right began to attract more members. Still personally popular, the king nevertheless came under increasing criticism for not supporting his own prime ministers. It was in this atmosphere of internal discontent and polarization and external shakiness that Daoud implemented the coup d'état he had been planning for a year in response to the "anarchy and the anti-national attitude of the regime." While the king was out of the country for medical treatment, Daoud and a small military group seized power in an almost bloodless coup. 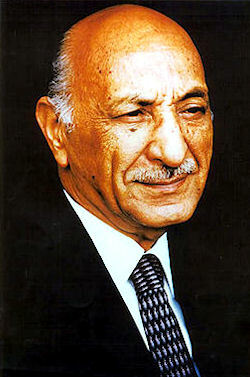 The stability Zahir Shah had sought through constitutionally sanctioned limited democracy had not been achieved, and was a generally favorable response greeted Daoud's reemergence even though it meant the demise of the monarchy Ahmad Shah Durrani established in 1747.